Ages 3 through 8. 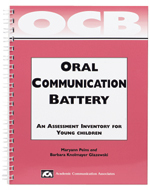 The OCB is an informal assessment tool that can be used to assess phonology, syntax, semantics, morphology, and pragmatics. Following directions in sequence, word and sentence comprehension, storytelling, phonological awareness, articulation/phonology, voice, fluency, and conversational communication skills are examined. This inventory helps you to identify specific strengths and weaknesses so that you can plan intervention programs. Morphology - Assesses present progressive, prepositions, plurals, past irregular, possessive, uncontractible copula, articles, past regular, third person regular and irregular, uncontractible auxiliary, contractible copula, and the contractible auxiliary. Sound Discrimination (identifying words as same or different. This is not a norm-referenced measure. It provides information about specific behaviors that are interfering with effective communication. This is an essential tool for assessing young children and planning intervention programs.